The farm is located in Miyagi Prefecture in eastern Japan, the area that was badly hit by a powerful earthquake and tsunami in 2011. At 25,000 square feet, it is nearly half the size of a football field, and 17,500 LED lights spread over 18 cultivation racks reaching 15 levels high are a key to the farm’s success. The LEDs were developed for the project by GE and emit light at wavelengths optimal for plant growth, allowing Shimamura to control the night-and-day cycle and accelerate production. By controlling temperature, humidity and irrigation, the farm can also cut its water usage to just one percent of the amount needed by conventional outdoor farming. “What we need to do is not just setting up more days and nights. We want to achieve the best combination of photosynthesis during the day and breathing at night by controlling the lighting and the environment,” says Shimamura. The systems allows the farm to grow nutrient-rich lettuce two-and-a-half times faster than an outdoor farm. Wasted produce is also reduced from around 50 percent down to just 10 percent of the crop. This means a 100-fold increase in productivity per square foot. The LEDs also last longer than fluorescent lights and consume 40 percent less power. Of the successful partnership, Shimamura adds, “I knew how to grow good vegetables biologically and I wanted to integrate that knowledge with hardware to make things happen.” The GE Japan team is convinced that indoor farms like the one in the Miyagi Prefecture could be a key to solving world food shortages. The project partners are already working on similar indoor farms in Hong Kong and the Far East of Russia. One has to wonder if these lettuces are as nutritious as those grown in the earth, with real sunlight. starving global citizen: "Lettuce?? Again??" That employee is wearing the biohazard suit to avoid contaminating the produce or the growing area, since the nutrient solution is reused for a long time and the humidity is fairly high. Mmm, look at the healthy-looking outfit of that employee. man, this guy is living one of my dreams! haha! I'd love to work with this guy to solve world hunger (and rising prices) through technology. 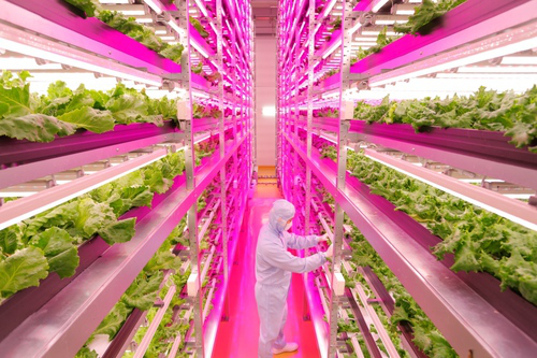 A former Sony Corporation semiconductor factory in Japan has been converted into the world’s largest indoor farm, all illuminated by LEDs. Having only started production a year ago, the farm is already shipping out 10,000 heads of lettuce per day. Japanese plant physiologist Shigeharu Shimamura, CEO of Mirai Co., has partnered with GE Japan to make his dream of a water, space and energy efficient indoor farming system a reality. At 25,000 square feet, the farm is nearly half the size of a football field. 17,500 LED lights spread over 18 cultivation racks reaching 15 levels high are a key to the farm’s success. The LEDs were developed for the project by GE and emit light at wavelengths optimal for plant growth, allowing Shimamura to control the night-and-day cycle and accelerate growth. The systems allows the farm to grow lettuce two-and-a-half times faster than an outdoor farm. Wasted produce is also reduced from around 50 percent down to just 10 percent of the crop. This means a 100-fold increase in productivity per square foot. Of the successful partnership Shimamura says, “I knew how to grow good vegetables biologically and I wanted to integrate that knowledge with hardware to make things happen.” The GE Japan team is convinced that indoor farms like the one in the Miyagi Prefecture could be a key to solving world food shortages. The project partners are already working on similar indoor farms in Hong Kong and the Far East of Russia.